Markets end 13-month low. Markets struggling under bear grip as the benchmarking indices closed low on Wednesday, thus continuing fall for the third straight session. Mumbai: Markets struggling under bear grip as the benchmarking indices closed low on Wednesday, thus continuing fall for the third straight session. The banks have played spoil sport by dragging the market lower, as US Fed rate hike fears looming large over the investor sentiment. While good buying on tech, ITC and RIL shares could limit the down slide. 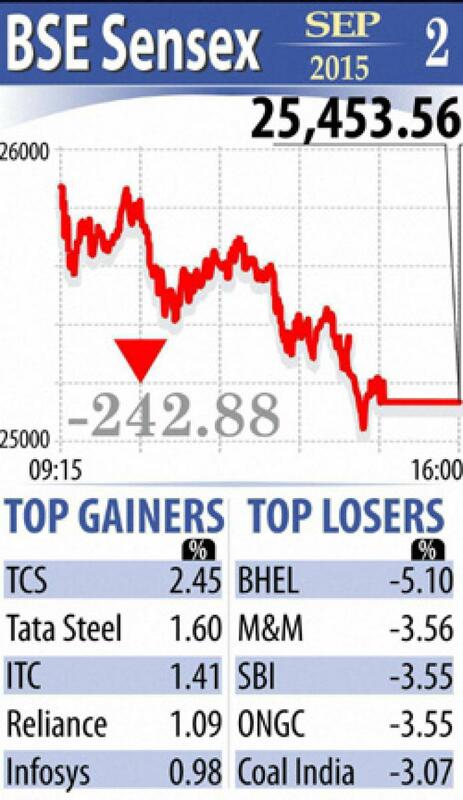 Sensex ended down 243 points at 25,454 and Nifty dipped 69 points at 7,717. Also the broader markets - midcap and smallcap - closed the session in line with larger caps. Midcap index was down by 0.8 per cent while smallcap index gained o.2 per cent. The markets fell, even as, the government agreed to AP Shah penal recommendation that minimum alternate tax (MIT) shall not be levyed on overseas portfolio investors, retrospectively. Experts say that the market is moving towards short-term bottom, as technically Nifty may get support at 7,660, from short-term view. On sectoral front, excepting IT, FMCG and Realty indices, all other sectors closed negative with Capital goods, Bankex and Power indices down up to 2 per cent each. The bank stocks fell up to 3.5 per cent as the central bank issued guidelines how to calculate lending rates, which aimed at uniformity in the lending rates. HDFC Bank, SBI, Axis Bank and ICICI Bank were down between 0.5 to 3.5 per cent each. From auto pack, Maruti down 0.7 per cent, M&M lost 3.6 per cent, Tata Motors 1.7 per cent, Hero MotoCorp fell over 1.7 per cent and Bajaj shares fell by 1.7 per cent. The gainers: TCS, up 2.45 per cent at Rs 2,601; Tata Steel, up 1.60 per cent at Rs 219.65, ITC, up 1.41 per cent at Rs 320; RIL, up 1.09 per cent at Rs 849.30 and Infosys, up 0.98 per cent at Rs 1,100.30. The losers: BHEL, down 5.10 per cent at Rs 206.55; M&M, down 3.56 per cent at Rs 1,134.95; SBI, down 3.55 per cent at Rs 230.60; ONGC, down 3.55 per cent at Rs 225.55; and Coal India, down 3.07 per cent at Rs 344.50.